Religious beleifs of the participants of the contest “Faith and religion in contemporary Russia” : Non-profit research based consulting "Sreda"
In her interview to the recerach company “Sreda” Canadian anthropologist religion Sonja Luehrmann said: «I think it is ideal when a religious community is researched by its own adherents as well as outsiders, because they contribute different perspectives and have access to different aspects of community life. ». 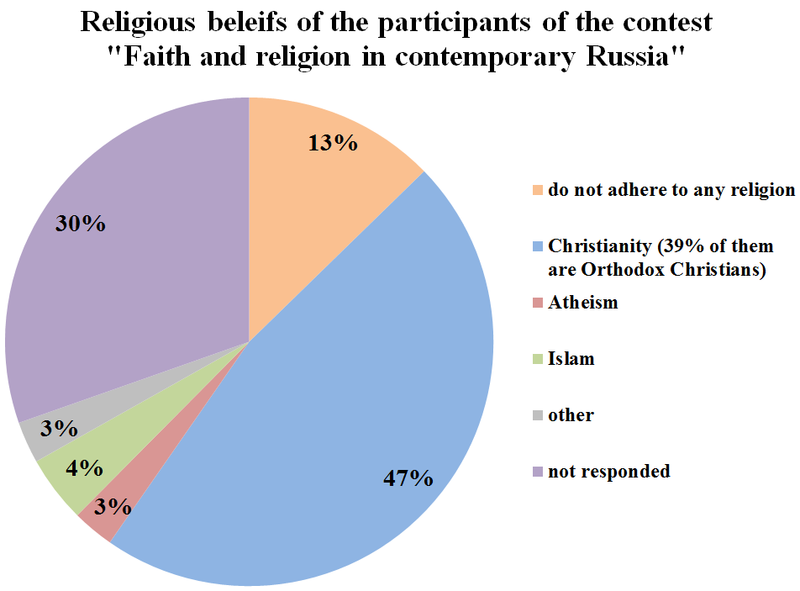 Did we manage to get it during the research contest “Faith and Religion in Contemporary Russia”? As we have already written before, many of the research papers were written individually, and some of them were written in a group of 2-3 people. There were 181 participant on the whole. What are the religious beliefs of ou participants? All the contestants were asked to answer the questionnaire, one of the questions reads as follows: “Do you follow any religion, and if so, what it is?” 30% of participants did not respond, while 70% of them gave an answer (13% of them said they did not adhere to any religion, 3% described themselves as atheists). Slightly more than half of the participants consider themselves believers: 47% identify themselves as Christian (of which 39 % are Orthodox), 4% are Muslims, there were also few peopele who belong to Judaism, buddhism etc.